ALTON — Dennison Dutton Foster, Jr., age 89, died peacefully in his home Tuesday, Oct. 17, 2017. Denny was born at Saint Joseph's Hospital in Alton, Illinois, the son of Dennison Dutton Foster, Sr. and Marie Reintges Foster. He graduated from Alton High School spending summers working for his father at Foster's Drug Store. Denny attended Purdue University where he was a member of Phi Kappa Psi fraternity. He graduated with a degree from the Purdue School of Pharmacy in 1950. After graduation, he became a licensed pharmacist in both Indiana and Illinois. In 1947, he met his future wife, Virginia (Ginny) Dean Canan (from Lafayette, IN) at Purdue and they were married July 29, 1950 in Lafayette, Indiana. In 1951, Denny went into the Army Medical Service Corps attached to an Infantry Battalion of the 28th Infantry Division in Augsburg, Germany. His medical corps training led to the position of Assistant Battalion Surgeon. October 29, 2014 he was privileged and honored to be part of the celebrated Washington, D.C. Honor Flight recognizing his service for his country. After his Army service, he returned to Alton and worked as a pharmacist at the family-owned pharmacy and eventually owned and managed Foster's Drug Store. In 1980, he closed the 45-year-old pharmacy and opened Foster's Photo located east of Alton Square. Denny retired in 1991. Denny was one of the founding members of Pride, Inc., was on the Board of Germania Bank for four years, member of the Board for Greater Alton Chamber of Commerce, and was a charter member of Lockhaven Country Club. 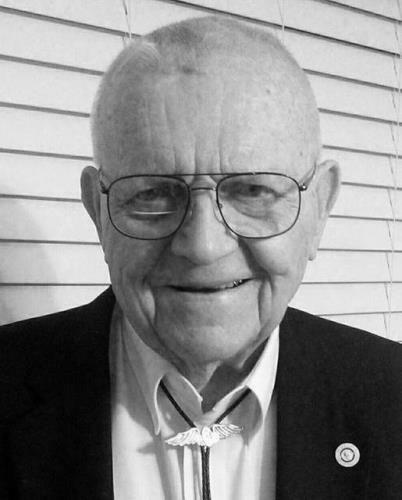 Denny was a loyal and long time member of Alton/Godfrey Rotary Clubfor over 50 years and a frequent visitor at the Wood River Rotary Club where he was selected for the honor as a Paul Harris Fellow. Denny was also a long time member of First Presbyterian Church and served as a Deacon. Denny started his boating hobby with a small ski boat that he used to enjoy water skiing with his daughters and their friends. Eventually, he owned a series of houseboats so that Ginny and Denny could travel and entertain family and friends. Denny was an avid reader, reading cover to cover anything he could put his hands on, including instruction manuals, while retaining fascinating information that led to great conversations. Denny was committed to his family, his friends, and forever a huge fan of his hometown. Denny received his Private Pilot's license in 1968 and went on to earn a multi-engine and instrument rating. During his flying years, he delivered new planes, ferried Cessna airplanes for Walston Aviation, and was a member of Sportsman Pilot Association. Accumulating over 2,000 flying hours allowed his family to experience many fascinating travel experiences and destinations. He always said partnerships and planes were the best way to fly! Surviving are his daughters, Ann Elizabeth Lukes (Rob) of Carmel, Indiana and Sarah Canan Kee (Bob) of Kerrville, Texas, his grandchildren, Elizabeth (Lukes) and Chris Bennett, of Carmel, Indiana, Melissa (Lukes) and Matt Singler, of Nashville, Tennessee, Nicholas Lukes and fiancé, Katelyn of Chicago, Illinois, and Tyler and Molly Kee of Austin, Texas, and his two great-grandsons, Knox Bennett and Jonah Kee. He will be fondly remembered and missed by his special friend, Marion Stewart, his nieces and nephews and all the important people in their lives, and his faithful and generous neighbors and friends both in Alton and Godfrey. Being a true "Altonian", his path crossed numerous generations of caring friends. Denny was preceded in death by his wife, Ginny, an infant son and daughter, his sister, Margery Foster Cox of AZ, and his parents, Denny Sr. and Marie Foster. Celebration of Denny's life was held at First Presbyterian Church, 4th and Alby, on Saturday, Dec. 2, 2017 at 10 a.m. Visitation will be prior to the service from 9 a.m. to 10 a.m. in the Parlor. Interment will be at the Sunset Hill Cemetery Mausoleum in Glen Carbon, Illinois. In lieu of flowers Memorial contributions may be made to First Presbyterian Church, PO Box 116, Alton, Illinois, 62002, in memory of Dennison (Denny) Foster.